Missouri Rep. Chuck Gatschenberger (R-Lake St. Louis) is sponsoring HB300, the High School Brain Injury Prevention Act. 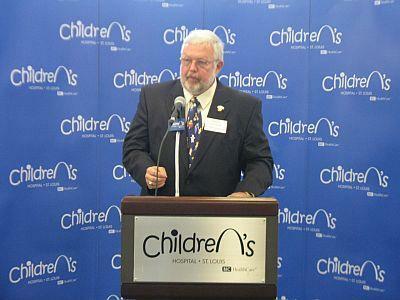 He spoke to the press about the bill today at St. Louis Children’s Hospital. Eureka High School sophomore Connor Pahl knows about traumatic brain injury first hand. He got a concussion playing goalie for his varsity soccer team last fall. Speaking at a press event at St. Louis Children's Hospital, Pahl says his coach did the right thing making him sit out the rest of the season. "I went to every practice and game to support them, and my coach wouldn't let me even kick a soccer ball without a doctor saying I could, so that was good," Pahl said. As many as 140,000 U.S. high school athletes sustain concussions each year. The director of the Pediatric Neurocritical Care Program at St. Louis Children's Hospital says there's no such thing as a mild brain injury. Dr. Jose Pineda says the effects of a concussion can be delayed for hours after an accident. They can range from short-term irritability and headaches to long-term cognitive impairment, and even death. He says the best treatment is rest - both physical and mental. "Before you go back to intense sports activities or intense testing or cognitive activities at school, you should be cleared by someone who has expertise in concussion," Pineda said. The High School Sports Brain Injury Prevention Act is currently awaiting a committee vote in the Missouri House of Representatives.